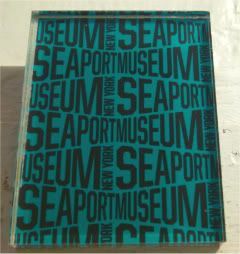 This past weekend, I visited the Seaport Museum to catch the last days of the Alfred Stieglitz exhibition, which I'll magnetblog as soon as I run and get that Camera Work magnet from the Met's Stieglitz exhibition tomorrow. Loved this museum. Yes, yes, it's possible that I might love every museum in the world, but I really enjoyed my visit! The Stieglitz exhibition was superdupercool, but I was truly blown away by the DECOdence S.S. Normandie exhibit. Before I get to the Normandie though, can I just say? I had the Coolest. Evening. Ever. Today was the second-ever Royal Rendezvous in New York Harbor - all three ships of the Cunard Fleet met this evening near the Statue of Liberty...and made fireworks! It was superdamn cool standing that the bottom of Manhattan island, seeing the three giant ships in the harbor, each like floating cities of light, each dwarfing the Statue of Liberty. They all poot-pooted their horns, and then paraded one after the other past Lady Liberty. First, we saw Queen Mary 2 come into the harbor. She's the largest of the fleet, and can handle 2,620 passengers and 1,253 crew. And dudes. Dudes! She came about right there in the harbor, as if she were Pacey's tiny True Love, rather than her 203 feet tall, 1,132 feet long and 150,000 tons! After she turned downstream, she was followed by Queen Victoria, and then Queen Elizabeth, all while the fireworks broke through the skies. It was awesome standing on the esplanade watching these giant ships go by. Of course, it was 19 degrees, and I may never get feeling back in my fingers and toes, and my nose may have hypothermia, but it was worth it. I've never before wanted to take a cruise before, but I've decided, if I ever do, I will totally sail either the Queen Mary 2, Queen Elizabeth or Queen Victoria. Talk about seaworthy! But back to the French ocean liner, Normandie. At the time she sailed, she was the largest and the fastest ship in existence. And one of the most opulent ships ever seen. Kind of funny, given that she was christened during the Depression. When the war came, the French moored her in NY to be retooled into a troopship. Alas, she came to a fiery end through a bizarre construction accident. There's no doubt that had she made it through the war, that she would have seen many more years of service. The DECOdence exhibit gives you a good background on the ship's history, how the French government heavily subsidized the building of her, the marketing and PR blitz it went through. Plus, it also gives you a guided tour of the ship, her luxurious features and amenities, the glorious art deco design by the likes of Lalique and other designers of the day. They have a ton of artifacts to look at, matched up with fantastic giant images that makes you feel like you're right there in the Grand Salon. I swear, going through the exhibit makes you crazy, thinking of how wonderful it would have been to travel aboard the Normandie. Mind you, I'd only accept first class passage. The better to meet Cary Grant, don'tcha know.